Oct. 12, 2018 | 2:40 p.m. The purple carrot-seed moth is common across much of Europe, but is also increasingly found in North America. Of the two to three new, non-native and potentially-invasive insects in Wisconsin documented by the University of Wisconsin Insect Diagnostic Lab each year, some species make an appearance only to fade into the background with little impact, while other exotics like emerald ash borer and gypsy moth become heavy-hitting pests. The latest non-native pest to arrive in the state is the tiny purple carrot-seed moth (Depressaria depressana), and its impacts are not yet fully known. This species has a wide native range and can be found from western Europe through Russia to China. First documented in North America in 2008, it is so new that few images exist and it’s not included in the common caterpillar and moth field guides on the market. In the last decade, the purple carrot seed moth has been documented in many locations in southern Canada and the northeastern United States, and has also been spotted in a few scattered locations in Michigan, Indiana and Illinois. In mid-July 2018, two reports came into the lab in rapid succession from Kewaunee and Dodge counties. These cases were confirmed through visual inspection and caterpillar specimens that were reared to adult moths. After a July 18 discussion about the purple carrot-seed moth on Wisconsin Public Radio's The Larry Meiller Show, several additional suspected cases were reported in southern and eastern parts of the state. By the end of summer, the purple carrot-seed moth had been confirmed in a total of eight counties in Wisconsin: Kewaunee, Dodge, Milwaukee, Sheboygan, Brown, Columbia, Washington and Racine. These insects get their name due to their association with flower clusters (umbels) of plants in the carrot family (Umbelliferae). Caterpillars of the purple carrot-seed moth are small, but dozens can feed on a single umbel. The caterpillars are dark green or reddish with many conspicuous white spots on their bodies. In addition to feeding on the flowers, these caterpillars tie together floral parts with silken webbing, which can render herbs like dill unusable. Eventually the caterpillars pupate within the webbing and emerge as adult moths a short time later. Adult purple carrot-seed moths are three-eighths of an inch long with a pale patch near their head. Their purplish-gray wings are folded back along the body when not flying. The caterpillar of the purple carrot seed moth has many conspicuous white spots on its body. A caterpillar of the purple carrot seed moth feeds on a dill plant. A dill plant was damaged after feeding by purple carrot-seed moth caterpillars. The effects this non-native insect may have on Wisconsin gardens and agriculture are not fully known. Reports of plant damage in the state thus far have been on dill, cilantro and Queen Anne’s lace. Due to the plant parts attacked, the impact on carrots, celery and parsnip crops will likely be minor. The biggest impacts would be expected with umbelliferous crops commonly grown for seeds, such as dill, fennel and coriander. 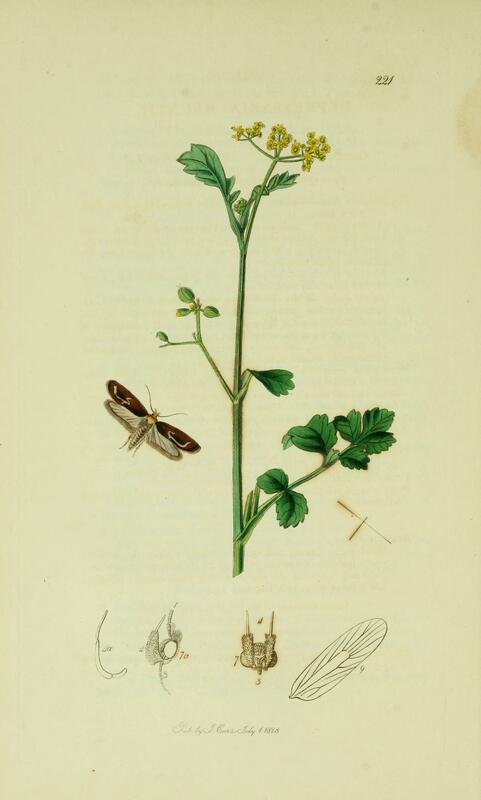 The caterpillars of the purple carrot-seed moth, illustrated in British Entomology and originally published in the 1820s and 1830s, feed on a specific type of flower called an "umbrel." Several organic control products may offer help on herbs: insecticidal soap and Neem oil are two low-impact products expected to help control this pest, if needed. Cutting out and destroying infested flower heads may be another helpful tactic. Sightings of purple carrot-seed moths in Wisconsin, on dill or other plants from the carrot family, can be reported to the UW Insect Diagnostic Lab, along with any photos to help document this species in the state. University of Wisconsin-Extension entomologist PJ Liesch is director of the University of Wisconsin-Madison Insect Diagnostic Lab. He blogs about Wisconsin insects and can be found @WiBugGuy on Twitter. Brown Marmorated Stink Bug A Growing Agricultural Pest In U.S.